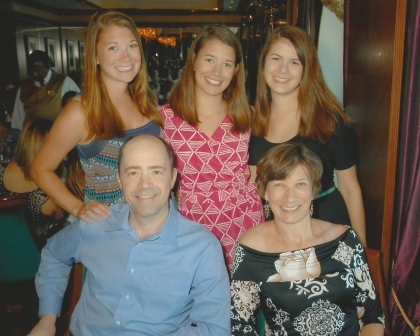 Steve and Debbie Russell explain why they joined the Journey to Cure after their daughter's diagnosis with systemic juvenile idiopathic arthritis (sJIA). As Courtney Russell’s sophomore year in high school was getting into full swing, she started getting sick. She had a fever, a rash, joint pain and a sore throat. At first, the doctors thought it was a parvovirus infection. Courtney was taking medication for pain, anti-inflammatory drugs and allergy medication, but nothing was helping and she got worse very quickly. It was after she was admitted to the hospital that she was ultimately seen by a rheumatologist. In just a few days, Courtney was diagnosed with systemic juvenile idiopathic arthritis (sJIA) with possible complications from macrophage activation syndrome, or MAS. MAS is a potentially life-threatening complication common with rheumatic diseases that causes a massive systemic inflammatory response. Within weeks of receiving the right treatment, Courtney was back on her feet. A few months later, she was running at a cross country meet, being greeted at the finish line by her crying parents. But the journey didn’t end there for the Russell family. As they learned more about the disease that had sidelined their daughter, Steve and Debbie, Courtney’s parents learned about the work being done by the Rheumatology Research Foundation. They heard about advances in research and treatment of inflammatory arthritis. They also learned how few rheumatologists are currently practicing, especially pediatric rheumatologists.